This took place behind 320 Esplanade, the building next door to the one that had been evacuated. Residents and neighbors were worried but the chief engineer was not overly concerned. “We didn’t want to see it go. We were hoping that it wouldn’t but it did and it’s not really the end of the world at this point…looks worse than it is,” said Tony Fortunato and engineer with Engineered Soil Repairs. 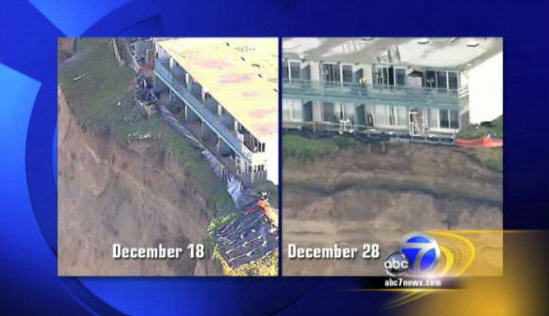 Fortunato said, unlike the condemned apartment building, enough cliff-side still remained behind the neighboring building. Nevertheless, it was significant. 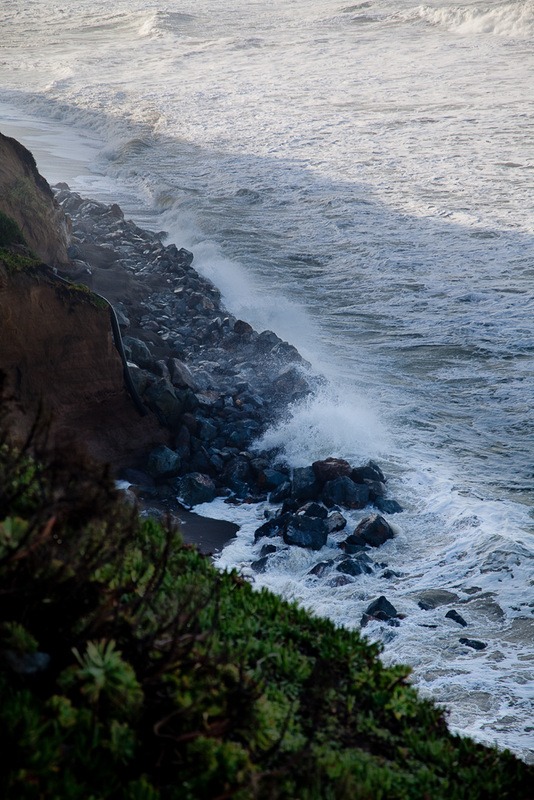 According to the report, approximately a ten by thirty foot long section of cliff-side collapsed. 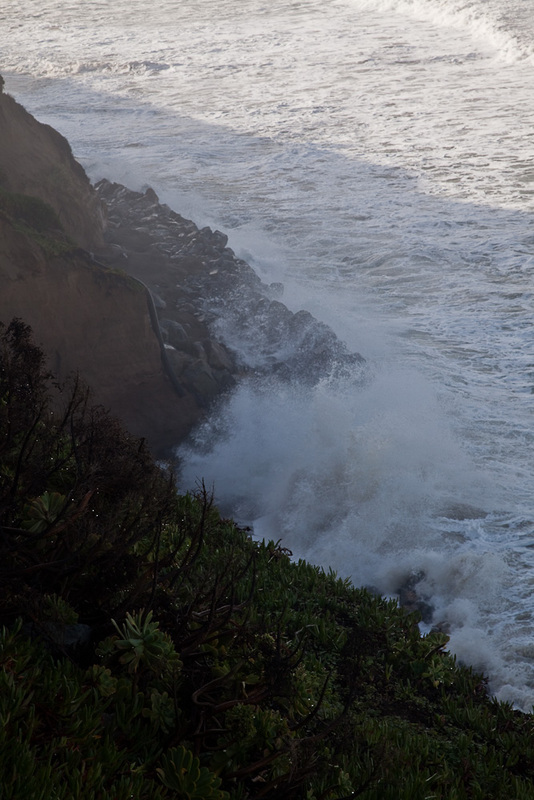 See the KTVU report for details: Huge Chunk Of Pacifica Cliff-Side Falls In Ocean. 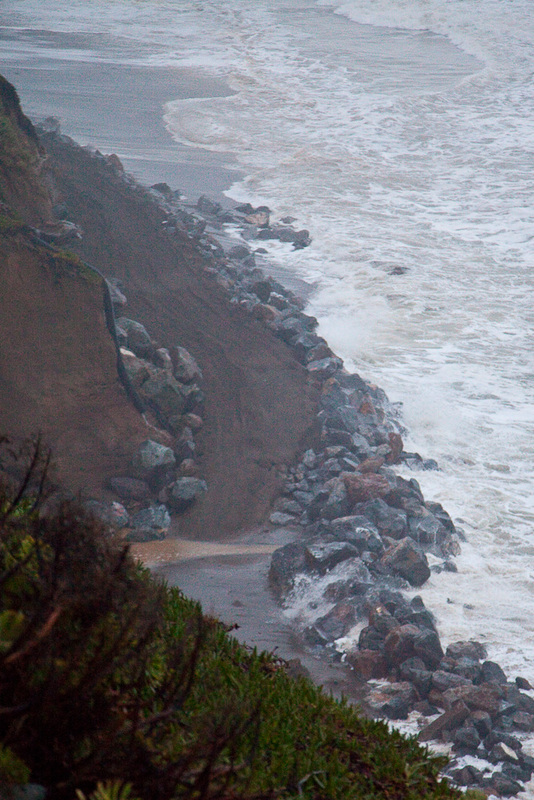 Alarming and sad news from Pacifica Riptide, Cliffhanger: Esplanade Continues to Crumble. Since yesterday an additional large section of earth has dropped away from the north end of 330 Esplanade. In this image I’ve added dates and green and red circles to highlight the newly lost dirt. Click the image for a larger size. 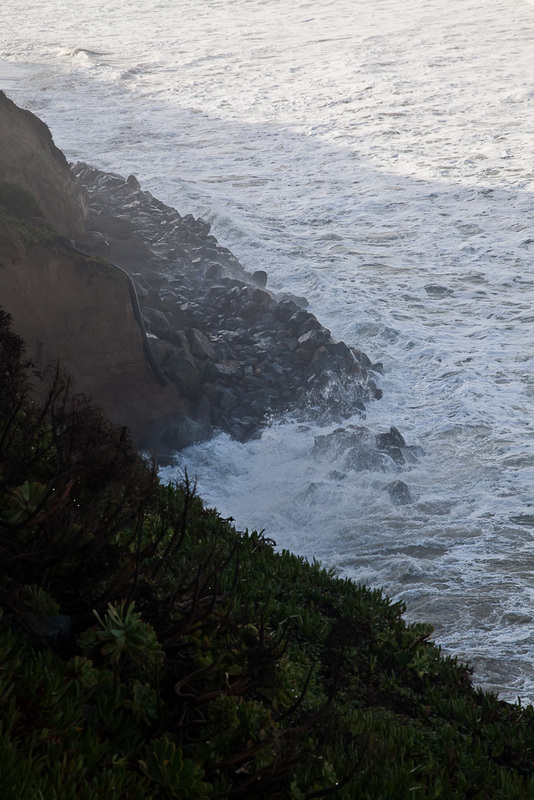 See the Pacifica Riptide item for the original full-size images. 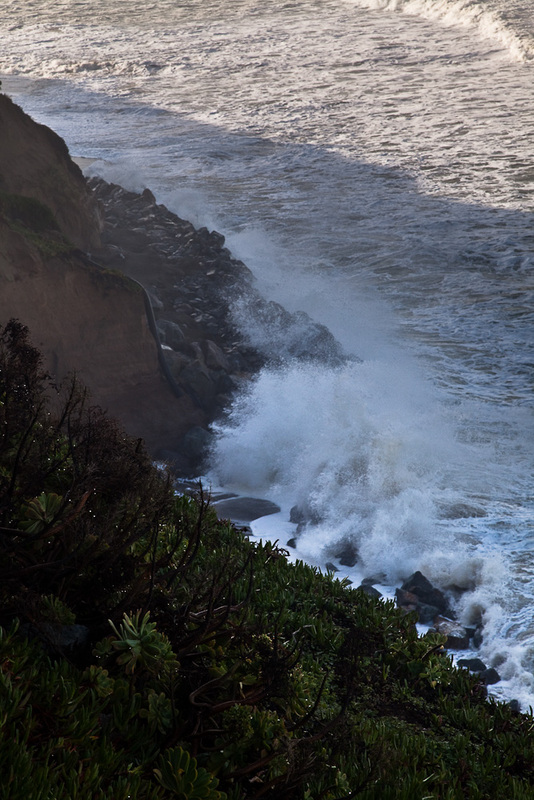 A big THANK YOU to Pacifica Riptide for the original images! This post is one part of my on-going coverage of this emergency. See my complete coverage at Evacuation underway at 330 Esplanade and a lot more photos than I included here in a Flickr collection. 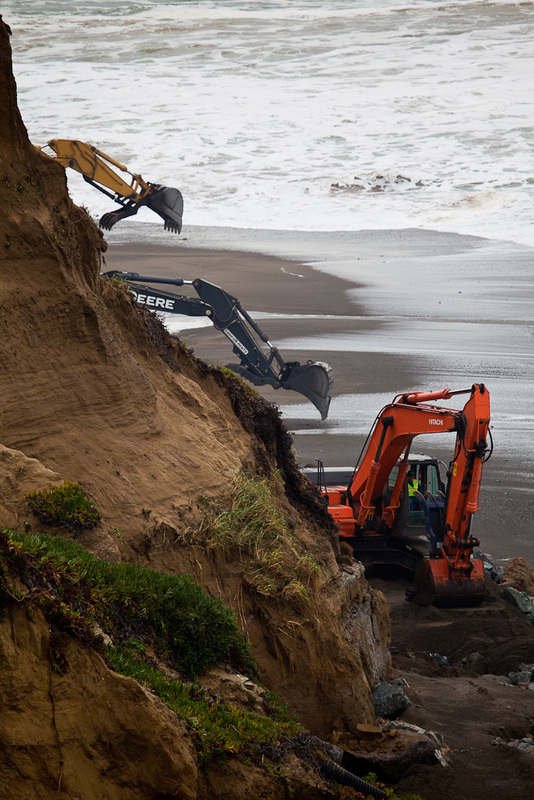 ABC7 KGO-TV Focus of Pacifica cliff repair shifts to second phase. Great story, knits together the end of the emergency phase one repairs and the plans for phase two work to reinforce the top of the cliff. “330 is pretty much completed. 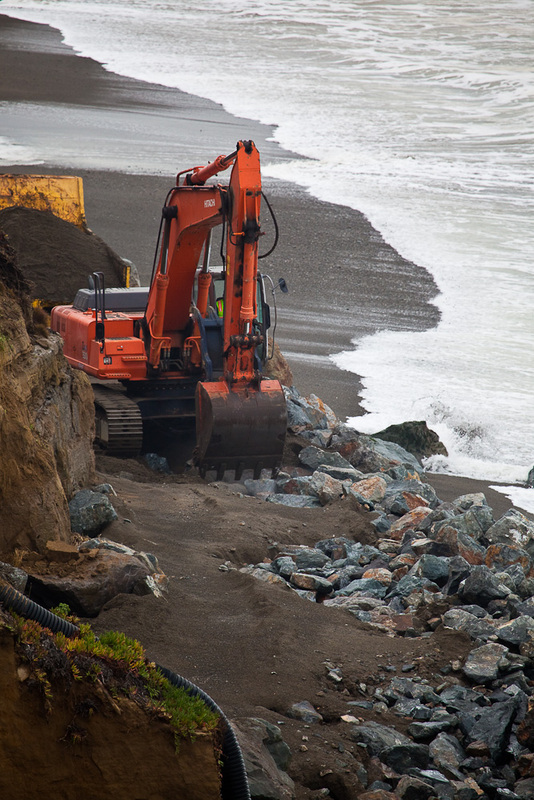 Coastal Commission came down and looked at it. We’re going to tune it up a little bit per their requirements,” said engineer Tony Fortunato. 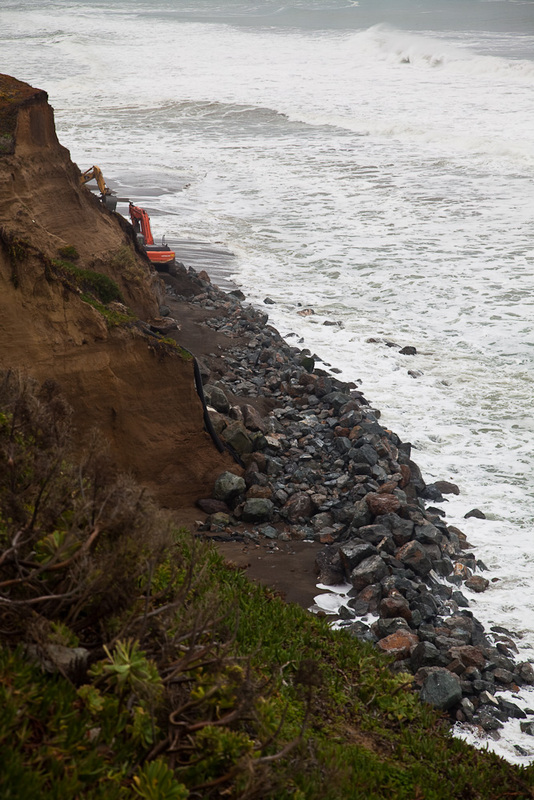 The engineers are reviewing several methods for stabilizing the still-eroding top of the cliff. 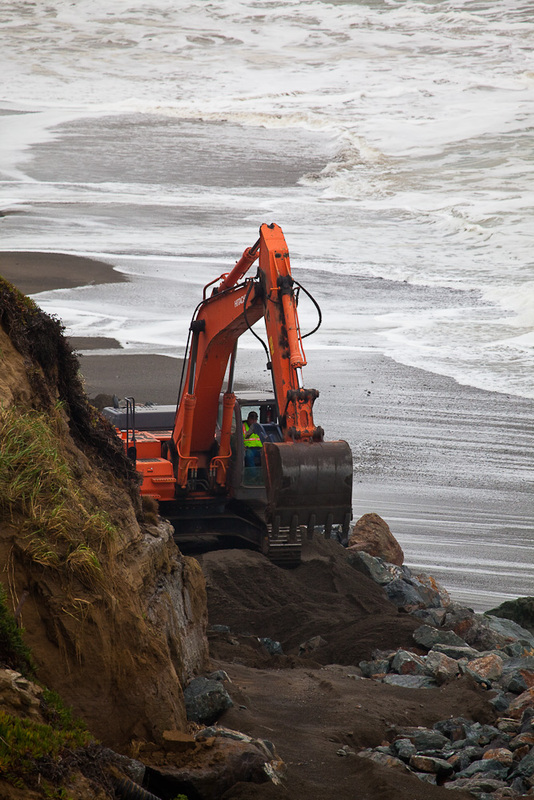 The one they will probably go with is called a “Soil Nailing System.” The City of Pacifica still has to approve the use of a horizontal steel rod system and engineers have to pre-determine precisely what angle to insert them to hold the soil together. If permits are fast-tracked the work could begin in a couple days. 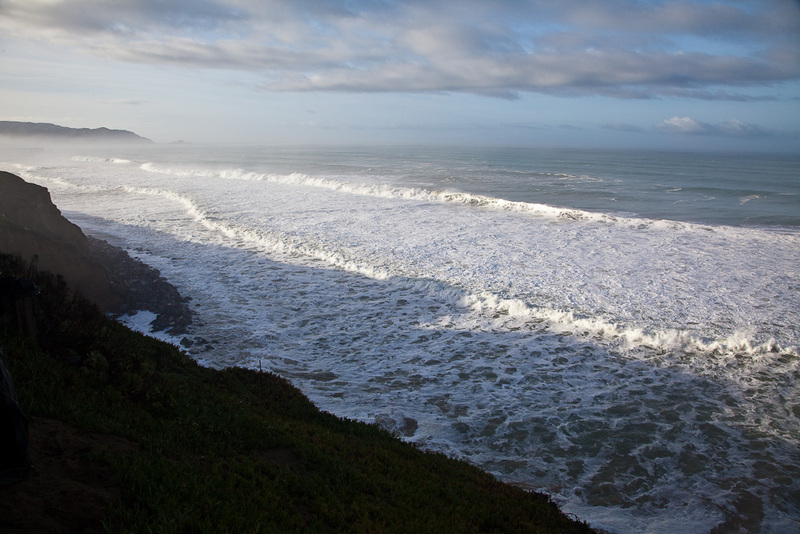 SF Examiner, Pacifica cliff no longer in emergency state. According to Tony Fortunato, superintendent at Engineered Soil Repairs Inc., the company hired to put the boulders in place, “The upper bluff is falling as well,” Fortunato said. “We have to fix that somehow.” He said the crews have been considering inserting soil nails, or large metal rods, into the cliff to stabilize it, but said he doesn’t know how long that process would take. Perhaps the quote from yesterday’s KGO-TV story was in error when it referred to using metal plates or sheets at the top of the cliff. 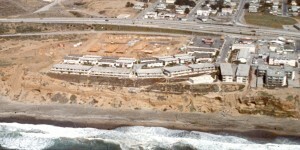 On December 18th, the day after the cliff collapse that triggered residents’ evacuation, a helicopter cameraman showed a minimum of 6 feet of bluff-top remaining behind 330 Esplanade. A similar view 10 days later (yesterday / Monday) showed that the bluff had dropped entirely away behind more than 30 feet of the building. The sand surface of the rock road is rebuilt in order for metal-tracked vehicles to be able to use it. I got a close up view of the tough little Marooka dump truck (see it on Flickr) they’re using to haul sand and rock, and it does indeed have rubber tracks. At the top of the bluff, crews are planning to embed sheets of steel that will allow them to rebuild at least some of the cliff that is lost — the most critical section right at the base of the patio at 330 Esplanade. Thanks to Pacifica Riptide for a good picture of the cliff behind 330 Esplanade showing sheer drop behind the building. 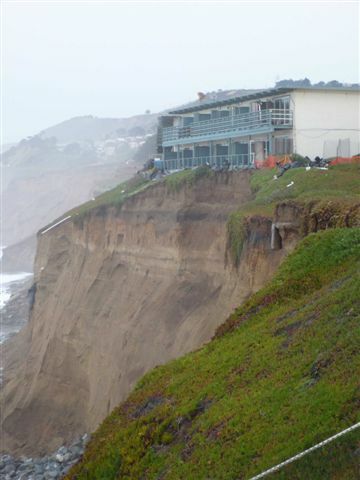 The loss of all of the remaining bluff above the cliff puts the building in grave danger while at the same time greatly increasing the cost of remediation. A sea wall could still be built but now it would have to be much taller. Possibly more complex, too – don’t know. 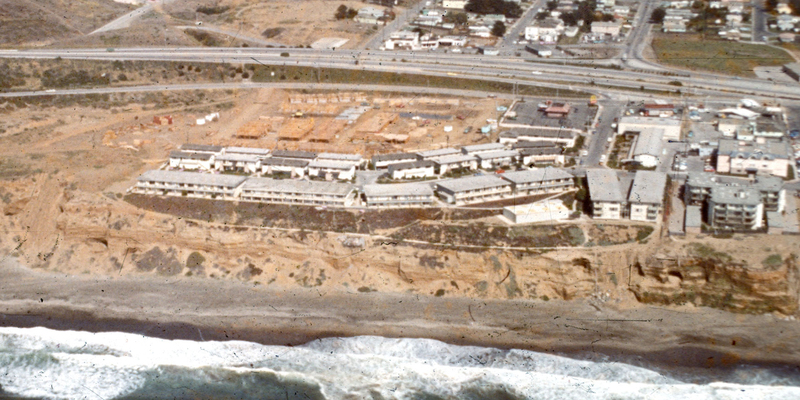 December 28, 2009: threatened Esplanade Avenue apartment building, revealing new loss of land at the top of the bluff. 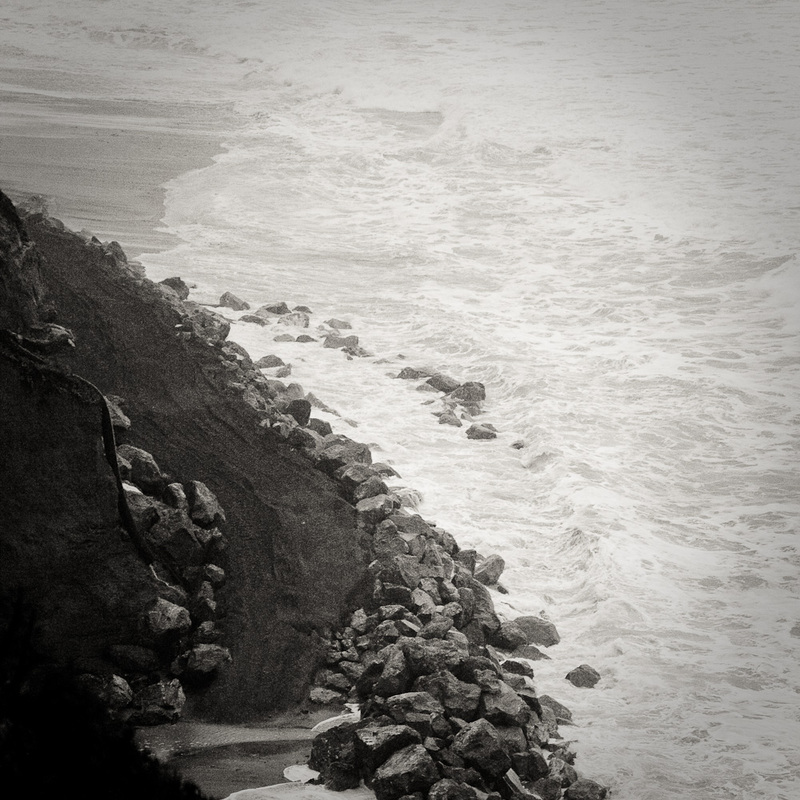 See the Pacifica Riptide post Sisyphean Task: Pushing Pebbles into the Pacific for a photo essay documenting the painstaking process of lifting rock to the cliff base. The author of the essay scoffs at the effort of moving rock this way, ridiculing in a knowing way that the effort is futile. Good images. I had a minor quibble with the text though – struck me as cliched and mean-spirited. I grow more convinced day by day that it’s just a matter of time, as quickly as a few months, and the building will be demolished. 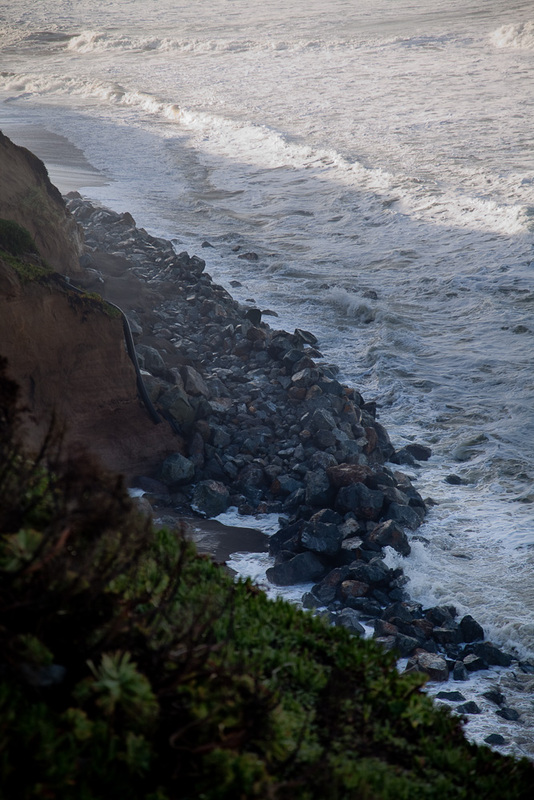 NOTE: This post is part of my coverage of the cliff erosion and collapse at 330 Esplanade Ave, Pacifica. For a complete chronology and links to many photos see Evacuation underway at 330 Esplanade. “We’ll be here all week,” Fortunato said. “We’re in pretty good shape now, but we got pounded pretty heavily yesterday,” he said of high surf and powerful waves that slowed down the work Saturday. He said that on Monday they will begin using the crane again to hoist the rocks over the apartment buildings to the base of the cliff. 3:40 PM – ABC 7 report. 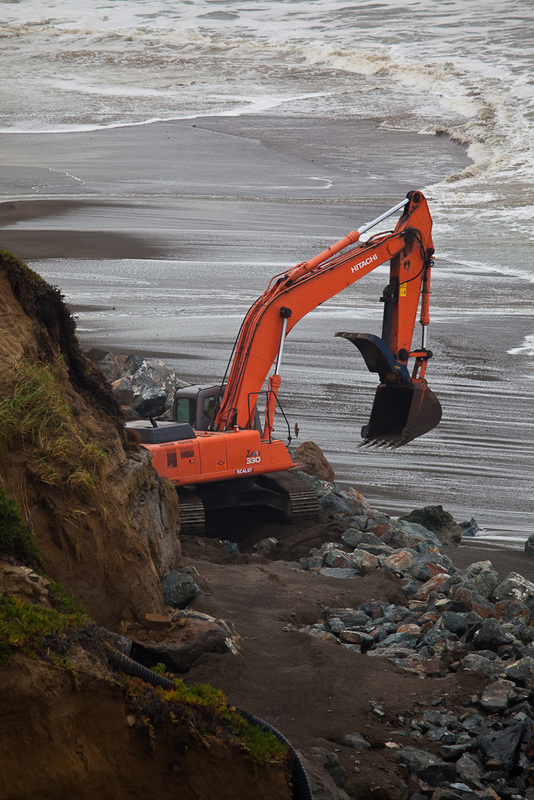 Highlight was the excavator working on the sand and backing down the beach into the surf. 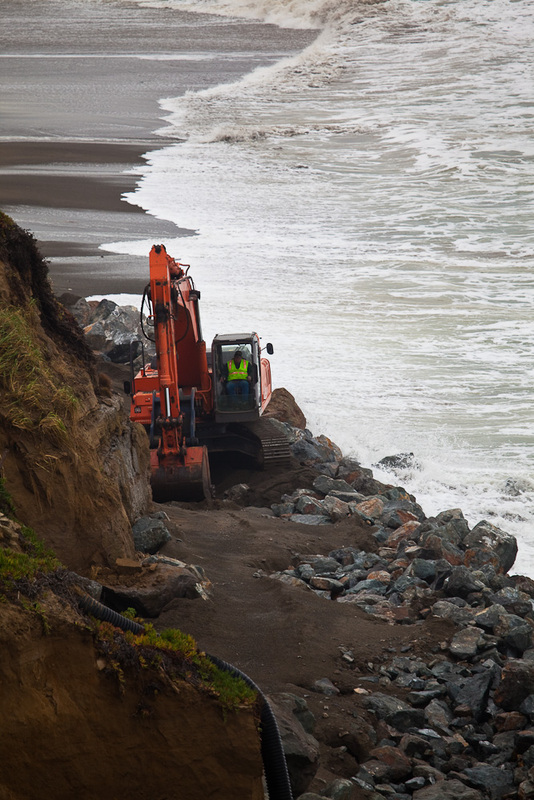 Tony Fortunato said work was “hammered” by weather and waves yesterday but didn’t say that really all they’re doing today is rebuilding the road washed out overnight, Crews continue moving rocks to Pacifica cliff. 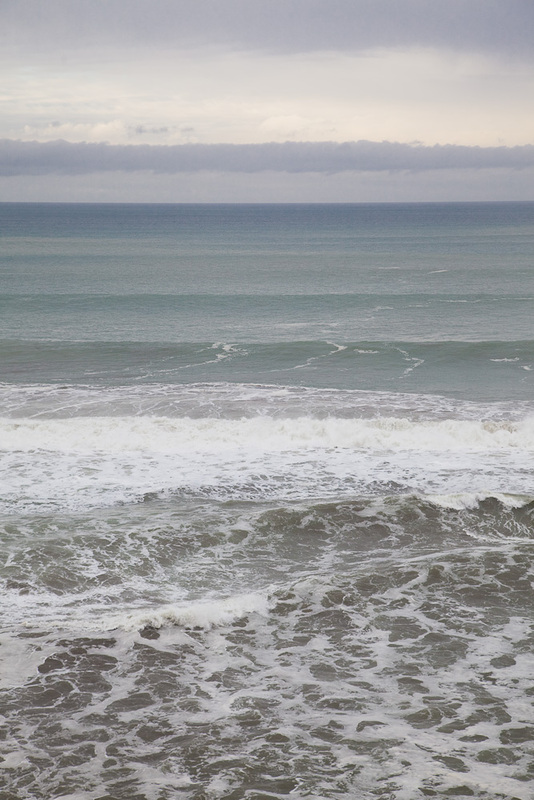 9:00 AM – sunny, pretty impressive surf, quiet. The sand surface of the road down on the beach is GONE. Rock is still there of course, but only something fairly agile will be able to cross to the base of 330. The crane and machines aren’t running up on Esplanade this morning. Perhaps they’re waiting for the tide to recede? Work with the crane on Esplanade got started bright and early, 7:00. We can’t see the water’s edge from here, so I can’t tell if the trucks are carrying rock down on the new beach road. Latest speculation / wishful thinking heard in the neighborhood: move the building back towards the street.